Steamed pumpkin over high heat for about 15 minutes, or until it’s soft. Remove from the steamer and mashed with a fork. Melt butter in a saucepan on low heat; add mashed pumpkin, sugar, salt, and cinnamon. Stir until the pumpkin is thick and glossy, about 20 minutes. Let it cool and chilled for at least 2 hours. Step 1: Dissolve yeast with lukewarm water, mix in the flour, and cover with plastic wrap or cloth. Let it rise for about 45 minutes, or until bubbles appear. Step 2: Combine water, sugar, and sea salt. Stir well. Then pour into the yeast mixture and add 2 cups of flour and shortening. Knead the dough until it’s smooth. Cover with plastic wrap, or cloth and allow the dough to rise until it has double in bulk, about 2 hours. Make the buns: Knead the dough for a minute and divide into 2 portions. Roll into a cylinder and cut into 8 pieces (small buns). Repeat with the second portion. You will have 16 small buns. Cover with plastic wrap and let the dough rest for 15 minutes. Flatten each piece of dough with palm of your hand. Roll the dough into circles with the edges thinner than the center. (About 2 ½ inches circles) Place a heap tablespoon of pumpkin paste on the center of dough and draw the sides in to enclose the filling and seal properly. Then turn the buns over and place on baking cup. Continue with the rest of dough and filling. Cover loosely with plastic wrap and let rest and rise again for another 25 to 30 minutes. Place water in a steamer over high heat. 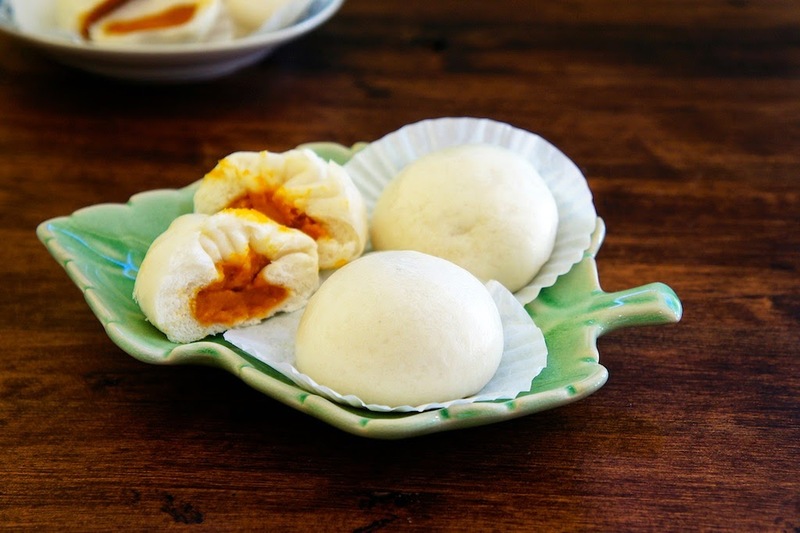 Once the water boil, adjust the heat to low and steam the buns for about 15 minutes. Serve Warm. What a great Fall flavor bun! Looks very sweet and beautiful!